Ricky Rubio grew up right before our eyes as a Spanish YouTube sensation dating back to 2006. Now older and wiser, he has found a near-perfect basketball situation in Utah after years of floundering in Minnesota. It’s a bit jarring to learn Ricky Rubio is only 27-years-old. If it seems that the former top-5 pick has been in our lives for a decade now, well, it’s because he nearly has. Rubio was selected in the 2009 draft, one of two point guards (who could forget Jonny Flynn!) taken back-to-back by Minnesota with Steph Curry still on the board. We’ve seen plenty of versions of Rubio over the years, beginning with his time as the Spanish YouTube sensation dating back to 2006. Now older, wiser and heavily bearded, Rubio still isn’t long in the tooth. In fact, he’s now the best he’s ever been. Rubio’s career arc hasn’t shown much of a linear progression. He entered the league as one of the most heralded foreign prospects in NBA history, a flashy passing prodigy with impressive credentials. At 16, Rubio carried Spain to the FIBA Europe Under-16 Championship, leading the tournament in points, rebounds and assists. His dominance on the European circuit led to a rockstar status in draft circles. Scrolling back through Rubio’s DraftExpress profile contains a flood of praise and proclamations—“Let the hype roll!” in 2006, “we’’re talking about a truly special talent” in 2008—making it a slight surprise when he wasn’t selected until the fifth pick in 2009. The former prodigy showed flashes of brilliance as a rookie with Minnesota after sticking in Spain for two seasons, earning All-Rookie honors in 2011–12. But as the Kevin Love era ended, Rubio’s Timberwolves floundered, winning just 16 games in 2014–15 and 29 the year after. Karl-Anthony Towns and Andrew Wiggins didn’t mesh with Rubio, who looked like a professional conductor running a middle school orchestra. Minnesota ranked in the bottom third in turnovers committed each of the three years Rubio played without Love. Rubio wasn’t free from culpability for Minnesota’s plunge in the West. He shot an abysmal 35.6% in an injury-shortened 2014–15 campaign, a continuation of his career struggles from the field. In December 2015, Rubio claimed an especially ignominious record. Of players who had logged over 5,000 career minutes since 1979–80, Rubio held the worst shooting percentage in NBA history, making just 36.5% of attempts in nearly 7,000 career minutes. It was an anchor weighing down his career. His Minnesota tenure ended in 2017 when the Timberwolves shipped Rubio to Utah in exchange for a protected first-round pick. And in one season with the Jazz, Rubio was reborn, reforming both his career and Utah’s standing in the West. The most noticeable metric in Rubio’s rise last season was his shooting percentage, especially from beyond the arc. After shooting a career 31.5% from three in Minnesota, Rubio saw a significant spike last season, canning over one three per game for the first time in his career while making 35.2% of attempts. Add a career-high in effective field goal percentage, and Rubio’s offensive arc looked similar to late-career Jason Kidd. Once an albatross without the ball in his hand, a career low in usage percentage didn’t tank Rubio’s efficiency. In head coach Quin Snyder’s expansive playbook, Rubio became an explosive secondary playmaker next to Donovan Mitchell, flying off screens for mid-range jumpers and lobs to Rudy Gobert. 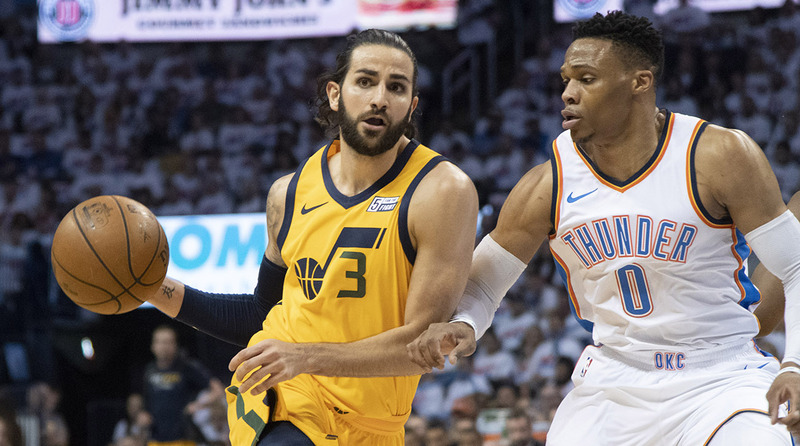 Utah’s guards torched Oklahoma City in round one of the Western Conference playoffs, bullying either Alex Abrines or Raymond Felton when they lined up beside Westbrook. Utah’s 115–102 victory over the Thunder in Game 3 illustrated Rubio at his best. Ending the game with his first-ever playoff triple double, Rubio unlocked every facet of his offensive arsenal. A pair of first-half threes forced Oklahoma City defenders to respect Rubio from outside the arc, no longer severely sagging off the pick-and-roll. The made triples opened lanes for classic Rubio. He floated lobs to the outstretched arms of Gobert and whipped crosscourt passes to open three-point shooters. A one-legged three to end the third quarter gave Utah a 14-point lead it would never relinquish, and Rubio ended the night with 26 points, 11 rebounds and 10 assists in a 115–102 Jazz victory. The performance was reminiscent of Rubio’s days in Spain, controlling every facet of the action as his team rolled to victory. Rubio has found a near-perfect basketball situation after years of floundering in Minnesota. Snyder’s motion mania springs Rubio off a multitude of looks, from pindowns on the wing to HORNS sets with Gobert and either Mitchell or Joe Ingles as dual screeners. As Rob Mahoney noted in SI’s Top 100 list, Snyder has fostered a perfect environment for Rubio, allowing his creativity to flourish while manufacturing quality shot attempts for the former non-shooter. The mind meld between Snyder and Rubio was a key reason behind Utah’s nine-spot jump in points per game from 2016–17 to last season. The Jazz entered 2017–18 as an afterthought in the West, viewed as a fringe playoff team without Gordon Hayward. That won’t be the case in 2018–19. Mitchell’s ascent to stardom has placed a target on Utah’s back, with many considering the Jazz the third-best team in their conference. While the West is stacked this season, don’t expect Utah, or Rubio, to fade from contention. Last year wasn’t an aberration for the seven-year veteran, it was a signal of things to come, with a stabilized jump shot now in place alongside a dynamic backcourt mate and upper-echelon coach. A decade after capturing the NBA’s imagination, Rubio is finally the force we wished for back in 2009.